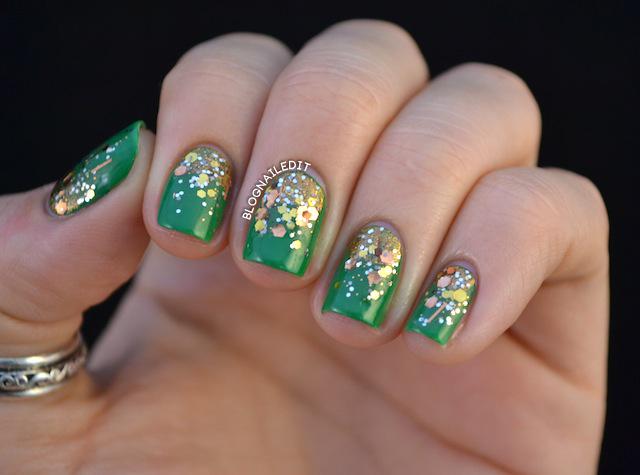 Here's the last post in my glitter and nail art week. If you're looking for some kind of inspiration and motivation to challenge yourself and your nail blog, consider doing a week of glitter and nail art. It gives you enough wiggle room to keep your manicures simple, but still requires that you do more than just layer some glitter over your regular polish. It forces you to think outside the box and is challenging enough to stick with without feeling obligated. For my final design, I wanted to showcase the glitter mainly, so I did a glitter gradient. The glitter is Clockwork from Sonoma Nail Art. I scored this one during her last sale, in addition to Pinot Envy. I have shown you the two others I have here and here. I piled Clockwork on at the base of my nails over Rising Star (OPI), which I painted over Posh (Revlon). I love Posh and I'm glad I bought it. I hope you've enjoyed glitter and nail art week at Nailed It as much as I have! Keep an eye on those Etsy stores as some restock constantly, some randomly, and some at a very specific time which they will tell you outright if you ask or check their info sections. This is awesome!! I need Clockwork in my life. so pretty!! i need Revlon Posh!! but I think it's almost the same as Revlon emerald? I love it. it's so pretty! Posh looks gorgeous too! I just might have to pick that one up next time I am out. Love this gradient. Nicely done. 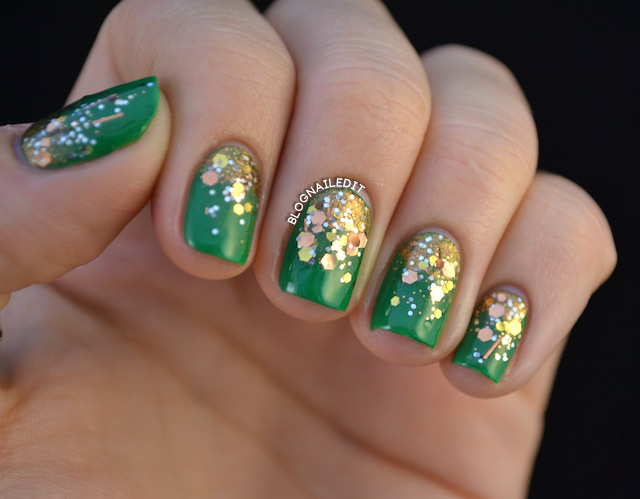 Love the glitter week idea! The green with clockwork is my favorite! Awesome! Your manis for this week were lovely!